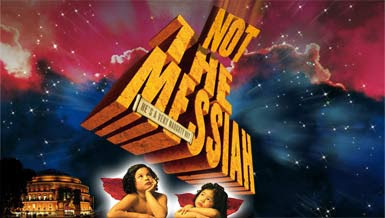 'Not the Messiah (He's a Very Naughty Boy) is a humorous oratorio based on Monty Python's Life of Brian & celebrating 40 years of python. Starring Eric Idle (baritonish) with guest appearances of fellow Pythons Michael Palin, Terry Jones & Terry Gilliam, Carol Cleveland & Neil Innes with William Ferguson (Brian), Shannon Mercer (Judith), Rosalind Plowright (Mandy) & Christopher Purves (Reg) and John Du Prez conducting the BBC Symphony Orchestra & Chorus with bagpipes and some sheep. The feature will be shown in cinemas across Europe for one night only on March 25th. To view the list of screening venues & to book tickets, click here!